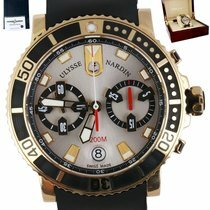 Ulysse Nardin Maxi Marine 353-66-3/323 Mens Watch. Box & Papers. 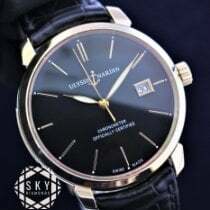 Ulysse Nardin Marine 1183-126-42 Mens Watch. Box & Papers. Ulysse Nardin has a history stretching back more than 170 years. This Swiss luxury watch manufacturer is a pioneer in silicon technology and well known for their unusual complications and top precision. 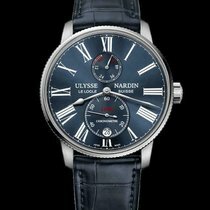 In the Guinness Book of World Records: "Trilogy of Time"
Since their earliest days, Ulysse Nardin have been raising the bar in the watch industry. It was their marine chronometers in particular that brought them fame. The company's anchor logo still reminds us of their maritime roots. The design of the popular Marine wristwatch collection is reminiscent of the early marine chronometers. From a technical perspective, these timekeepers have the most advanced technology of the 21st century. Anti-magnetic silicon components resist even the strongest magnetic fields and complications, such as a chronograph, offer additional functionality. One highlight is the Marine Regatta Chronograph introduced in 2017. It is geared toward sailing enthusiasts in particular thanks to its countdown function. The watch can time periods up to ten minutes. What's the mechanism's trick? At the start of the countdown, the central stopwatch second hand moves in a counter-clockwise direction. Once time has run out, the hand instantly changes its direction and thus functions as a timekeeper for the regatta. In 2001, the Freak caused a stir as one of the first watches with silicon components. Silicon is an especially lightweight, hard, and non-magnetic material that is being used more and more in the watchmaking industry. That's why, alongside Ulysse Nardin, manufacturers like Omega and Zenith are also using it in their high-precision timepieces. The Freak also revolutionized the visual side of haute horlogerie. Its design lacks a dial, crown, and hands. The movement itself displays the time while the case back is used to wind the watch. The time is set via the bezel. Ulysse Nardin is a driver of innovation in the Swiss watch industry. This was proven once again in 2017, when they presented the concept watch InnoVision 2 at the Geneva Watch Fair. It contains ten new mechanisms, including the so-called "Grinder" winding mechanism, which powers the movement with high efficiency. The Dual Constant escapement is another innovation used for the first time in the Innovision 2. This constant force escapement more evenly transmits power, leading to higher accuracy. These advanced technologies will steadily find their way into the movements of other watch series. 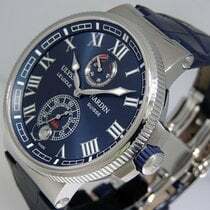 How much does a watch from Ulysse Nardin cost? Luxury watches from Ulysse Nardin are some of the finest Swiss timepieces. Their top models have elaborately designed dials, tourbillons, and numerous diamonds on the case, bezel, and band. Pieces in mint condition cost almost 1,000,000 euros. However, there are also markedly more affordable models. A pre-owned Ulysse Nardin Marine Chronometer costs around 5,000 euros, while a pre-owned Maxi Marine costs around 3,000 euros. If you'd prefer to purchase a new model, you should set aside around 5,000 euros. Mint condition watches from the sporty Diver collection feature rotating bezels and are reminiscent of classic diving watches. They are in the same price range. You can find pre-owned models starting at 3,000 euros. 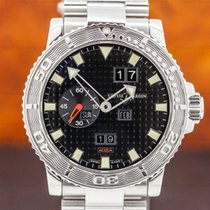 You can find great deals if you look for vintage watches. Classic wristwatches from the 1960s and 70s can be found for less than 1,000 euros. Some vintage chronographs and pocket watches are available for between 1,000 and 2,000 euros. Plan to spend around 3,500 euros for a pre-owned modern Marine Chronograph. New versions start around 8,000 euros. Ulysse Nardin turned the watch industry on its head with the presentation of the Freak in 2001. The revolutionary silicon technology and its design without hands, a dial, or crown amazed both members of the press and watch enthusiasts. Today, the Freak collection is a permanent fixture in Ulysse Nardin's catalog. You can buy pre-owned watches in yellow or white 18-karat gold for around 32,000 euros. If you want to buy a new titanium watch from this collection, you should expect to pay 62,000 euros. Prices for mint condition, white gold versions start around 66,000 euros, while those in rose gold start at 92,000 euros. In Ulysse Nardin's Diver collection, you can find sports watches that are commonly water resistant to 200 m (20 bar) and have a unidirectional rotating bezel to monitor dive times. These watches meet all the criteria of a true diving watch. Those interested in measuring time should take a closer look at the Diver Chronograph. With this model, you can measure periods of time up to 12 hours. Most cases of Ulysse Nardin diving watches are made of stainless steel or 18-karat rose gold. The Diver Black Sea versions are particularly trendy with a stainless steel case covered in black rubber. Some models feature red or blue indices and hands, making them even easier to read. There are also Diver Black Sea chronographs. You can find a pre-owned Ulysse Nardin Diver in fine condition starting around 3,000 euros. Black versions with a rubber coating cost around 4,000 euros. New stainless steel watches from this collection cost around 5,000 euros. Diver Chronographs in mint condition usually change hands for at least 8,000 euros. You should set aside 25,000 euros for a chronograph made of rose gold. Prices for pre-owned three-handed gold watches start around 14,000 euros; new they cost at least 17,000 euros. As the name of this collection suggests, Executive watches are aimed at leaders and anyone who loves modern dress watches. The Executive Dual Time in particular is the perfect watch for frequent travelers. Thanks to the second time zone display at the 9 o'clock position, you can always keep track of the time at home. The date display can be found on the other side of the dial at 2 o'clock. A highlight of the Executive Dual Time is its method of operation. Using the two buttons on the left side of the case, you can set the hour hand forward or backward in one-hour increments. This makes it even easier to set your watch to the local time. This model is available for both men and women. You can buy a pre-owned men's watch starting at 3,000 euros or 6,200 euros for a model in mint condition. At 7,600 euros, new women's watches are somewhat more expensive because they feature diamonds. 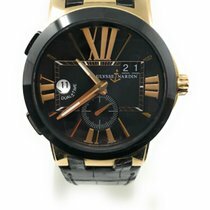 The Ulysse Nardin Executive Moonstruck is the series' top model. When first launched in 2009, the moon phase and tide displays took center stage. As a result, the moon phase display will remain accurate for 100,000 years. Pre-owned watches in fine condition can be found for around 38,000 euros. Gold watches in mint condition cost around 70,000 euros. You should plan on spending 95,000 euros for a platinum version. If you are in the market for a skeleton watch, look no further than the Ulysse Nardin Executive Skeleton Tourbillon. Unlike many watches, which only have a skeletonized dial, the Executive Skeleton Tourbillon also has a skeletonized movement. When wearing this watch, you can even see your arm underneath. You only have to wind the watch once every 170 hours thanks to the manufacturer caliber UN-171. That means that the power reserve lasts over seven days – quite an impressive feat. With a flying tourbillon, there is no bridge blocking your view of the tiny "whirlwind." The price for a new, 45-mm titanium watch starts around 26,000 euros. Ulysse Nardin made it into the Guinness Book of World Records with the so-called "Trilogy of Time." These three watches include the Astrolabium from 1985, the Planetarium from 1988, and the Tellurium from 1992. Genius Ludwig Oechslin used nothing other than a Texas Instruments calculator when he was performing the first calculations for the complicated movements at the beginning of the 1980s. His calculations for the Astrolabium were so precise that it only deviates one day in 144,000 years. The achievement was worthy of an entry into the famous Book of World Records. This highly complicated watch doesn't just show the position of the Sun, Moon, and stars, but also the periods of dusk and dawn and moon phases as well as the rising and setting of the Sun and Moon. If you're interested in this gold watch, be prepared to spend at least 22,000 euros. The Planetarium from 1988 is no less complex. In addition to the time, it also displays the positions of five planets – Mercury, Venus, Mars, Jupiter, and Saturn – in relation to the Earth and Sun. The price for this astronomical watch is almost 20,000 euros. The third watch in the series, the Tellurium, shows its wearer sunrise and sunset phases as well as those of solar and lunar eclipses. As if that weren't enough, this watch also visualizes the Earth's rotation as seen from the North Pole. A flexible wire traces an arc across the globe from the Tropic of Cancer to the Tropic of Capricorn and illustrates the passage of time. Furthermore, the watch shows where on Earth the Sun is currently shining. Examples in fine condition can be found for around 70,000 euros today. This trio of watches was Ulysse Nardin's renaissance. The Quartz Crisis had hit the manufacturer hard. In 1983, they were on the verge of closing in Le Locle. The businessman Rolf Schnyder, musician Dieter Meier from the Swiss band Yello, and his brother Balthasar Meier all invested in Ulysse Nardin and were able to save the company. Ulysse Nardin founded the eponymous watch factory in Le Locle in 1846, at only 23 years of age. Ulysse had learned the trade from his father, Léonard-Frédéric Nardin, making him the second watchmaker in the family. However, the young Ulysse wanted to learn more so he moved on and met Frédéric-William DuBois. DuBois was an expert in precision timepieces. Ulysse died in 1876 at the age of 53. His son, Paul-David Nardin, followed in his father's footsteps and took over the business. The French luxury-goods company Kering acquired the Swiss watch manufacturer in 2014. Brands such as Brioni, Gucci, and Bottega Veneta also belong to the Kering group, which was previously known as Pinault Printemps Redoute (PPR).